rec. Philharmonie Hall, Berlin, Germany, 18 March 2006.
interviews with conductor and with the composers. The Planets: Atherton, Bernstein, Boult, Boult, Boult, Holst, Karajan, Karajan, Lloyd-Jones, Mehta, Previn, Sargent, Slatkin, Solti, Steinberg, Stokowski, Stokowski, Susskind. This magnificent work � The Planets - remains fresh forever and can be listened to over and over without wearing out, comparable in this quality only to Rimsky-Korsakov�s Scheherazade***.� Holst borrowed generously from Beethoven, Haydn, Wagner, Debussy, Liszt, Bruckner, Elgar, Sibelius and Rossini, merging these influences with consummate skill to create a sense of grandeur and universality.� This is one of the earliest and most successful works to treat a large orchestra as a collection of small ensembles, with percussion, the harp, and certain repeated rhythmic figures unifying the movements into the perception of a whole.� Holst has captured perfectly the fascination of astrology with its grand vision of heavenly phenomena on the hugest scale mirrored in the everyday activities of human beings. Does Rattle displace any of those?� Not quite, although his Saturn, Uranus, Neptune, and Pluto are excellent.� On the first hearing I found Rattle�s opening tempo in Uranus just a trifle slow, but it soon became clear that this was just what is required here. Recorded sound is exemplary, showing significant recent advances in original recording and CD mastering techniques, and Rattle makes full use of the available dynamic range, especially in Uranus where the famous decrescendo truly goes from the painful to the barely audible.� However, I could have used just a trifle more deep bass at a few spots.� The brass and percussion sections are spread out along the back of the orchestra which enlivens the texture; this is done electronically, as the video shows the orchestra in normal seating arrangement. Komarov is a tribute to Soviet Cosmonaut Vladimir Komarov the first human to die in space, upon re-entry from orbit in 1971, after whom the asteroid #1,836 was consequently named.� The piece begins very tentatively with distant bird-like sounds which are intended to describe the loneliness of space and suggest the sound of electronic telemetry. It then moves far away from the valedictory mood into a noisy, jazzy parody of Britten�s �Sunday Morning� which rises to a roar, then fades abruptly to the silent sounds of the opening of the piece. 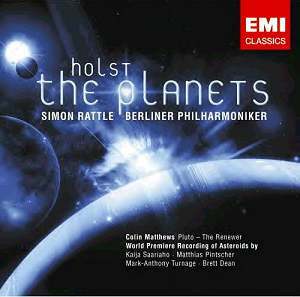 All of these, including Pluto, are definitely modern in texture and make no attempt to reproduce Holst�s late-romantic tonal orchestral universe.� In order of their musical merit, I rate Pluto first, followed by Ceres, Komarov, Osiris and Toutatis.� It is unlikely that they will all routinely be added to The Planets, but the first couple just might be heard often enough. Disk two, an �enhanced CD� plays the audio tracks normally on every CD player I tested it on, including my notoriously touchy Emerson portable.� A DVD player sees this disk precisely as a CD and only plays the audio tracks, not the video.� Only if you have a computer with a CD drive, and have Apple QuickTime installed, can you watch the video.� A DVD drive on your computer is not required.� If, like me, you find that Apple QuickTime behaves like a virus on your Windows computer, you can download a specially de-fanged version of QuickTime from a Russian hacker site.� The video track would not play at all on my 400 MHz Windows 98 Pentium II computer - the notes say 500 MHz Pentium III or above is required - but played easily on my 2.4GHz Windows 2000 computer.� Although I have autoplay turned off, the disk kept autoplaying anyway, and didn�t want to be stopped.� I recommend physically removing it from your drive as soon as the program quits playing, and you still may have to go into Task Manager to get rid of the program. The video program naturally features a talking head of Sir Simon explaining that he discussed the very first performance of The Planets with its creator Sir Adrian Boult.� He relates that the work is not well known in Berlin although it is very popular throughout Scandinavia and the English-speaking world.� It was Rattle�s idea to commission the four modern asteroid pieces, and each is introduced on video by the composer, Ms. Saariaho by means of still photos and a voice-over.� All the composers � except Dean � said they were reacting to the fear of asteroid collision even though in only one case is the asteroid one that is at all likely to collide with earth.� The video track therefore erupted with computer syntheses of stellar explosions and moving asteroids.� Dean said it was hearing a chilling recording of Komarov�s last words broadcast from space that inspired him to write the tribute to him, imagining in the lyrical middle section Komarov�s wife�s unrecorded farewell over the radio just before her husband�s orbiting capsule burned up.� Like most �making of� documentaries, I rate this as worth only a once-through, although I always do like watching orchestras at work and we get a few brief clips of the BPO working on Mars. EMI is to be praised for continuing to experiment with the DVD-Audio and Enhanced CD formats and I hope they benefit from this in the marketplace as they surely deserve to. *Commissioned by the Sir Simon Rattle and Berlin Philharmonic Orchestra.� Pluto was commissioned by the Hall� Orchestra. *** Rimsky-Korsakov triumphed by building on the balletic musical phrasing of Tchaikovsky and the work �La Mer� by Glazunov, linking the motion of the dancer�s body with the watery movement of the sea, as well as his own operatic instincts.� His own emotional involvement with the oceans of the world derived from his experience in the Tsarist Navy from which he was honorably retired. **** William Frederick Allan[sic], born Westminster, 7 August 1860, died Bude, 30 August 1917.� Astrologers even in that enlightened age avoided using their real names in public lest reprisals be taken against them.� Even so, Alan Leo was twice hauled into the dock for �fortune telling,� once fined �25, but he persevered and we astrologers today are in his debt.� Not surprisingly, Leo was his rising sign. ***** I often play the �Sanctus� out of the Requiem by Durufl�, in the full choral and orchestral version, as a Pluto when I play The Planets for friends.